You are here: Home / Community / Business News Bits / Hiring for Four Winds South Bend will be shifted to New Buffalo, Mich. 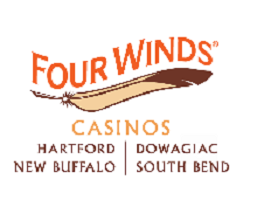 Hiring for Four Winds South Bend will be shifted to New Buffalo, Mich.
SOUTH BEND – The Pokagon Band of Potawatomi Indians’ Four Winds Casinos is moving its Four Winds South Bend Recruitment Center to its New Buffalo, Mich. location. Job interviews for the South Bend property will be conducted in New Buffalo, Mich. after June 15 but the office will remain open only for internal use, Four Winds said in a statement. The recruitment center was moved following the opening of the South Bend facility. The South Bend recruitment office had served as the primary hiring center for the South Bend property since June 2017. Four Winds said more than 1,200 new hires were conducted through the office at 506 W. South St. in downtown South Bend.